The 3am Teacher: Is It Saturday Already? 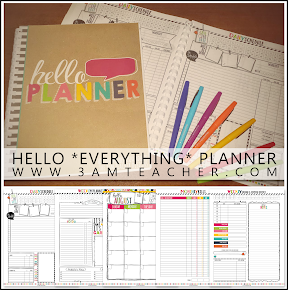 And a TpT Planner from Mrs. Shipley!!! Is It Saturday Already? And a TpT Planner from Mrs. Shipley!!! Seriously!! I can't believe it's Saturday already! Where DOES the time go? I just couldn't wait to share something truly amazing that a blogger friend of mine sent me last night, during one of our many midnight chat sessions. When no one else is up and active, we seem to find each other up and still working!! I never thought anyone else was as crazy as I was until...Mrs. Shipley came along!! This morning, around O'Dark O'Clock, we found each other both up and wide awake online. She might just kill me (just kidding), but I have to tell you how we started chatting. Her timing was perfect!!! I noticed a few messages and started going through them, when I came across a message from someone who had completed about 20% of my custom blog order form and left me quite a snarkey little message that woke me wide up! You know, the kind of message that gets your defenses going and no matter how tired you might be, your body begins to wake up? The other day I emailed people who had unfinished forms to see if they were still interest in getting a custom blog design. I had about 6 spots left at the time and I thought I would send a message out before deleting those unfinished forms from my account manager. I only have 3 spots left!!!! This person left me a message on my Facebook telling me that she had thought about getting a blog design from me, but because I never responded to her message, back in July, that she didn't know if she wanted to anymore. After she sent the message, she waited about 10 minutes before dropping another 2 cents my way... just in case she didn't get under my skin enough in the first message. The second message was a bit impatient (you know, because I am supposed to wait around my FB page and message everyone back within seconds), and she actually had searched for the message she sent me back in July and took a screenshot of her logo request that I never responded to. She went as far as to insult my worth as a designer as well, which was a bit hard to swallow. I know my pricing is higher than some others, but I seem to think my talent is worth it. I have to first believe in myself, right? There was more in her message and she even included a link to her wiki site and told me that she might want my help there... I don't do Wiki's!! By this point, I was so irritated and completely offended. I wish this gal could see the list of message feeds in my FB account and the number of emails I get on a daily basis. I have a huge work load, woman, and I don't sit around waiting for messages to come in... SERIOUSLY!!! I am human and I will, on occasion, not see a message or overlook one. Never on purpose, of course. Hi _____________! I am so sorry that I did not respond to your message back in July. There are times when emails or messages get over-looked and I certainly did not intend to ignore your message. Between emails and messages I get several hundred a day, so I try to keep up with them as best as I can. I think what you have is great and I wish you the best of luck on your new Wiki. It makes me wonder how many other people are holding grudges against me because I might not have answered their email... yikes!! I was still thinking of the previous message and wondered how she knew what I was reading... or did she? Me: "What are you laughing at?" Anyway, she was just laughing because I was still up and we could have a midnight giggle... the perfect remedy to rid my mind of the snarkey message prior to hers. Not only that, she sent me a PRESENT!!! I was going to wait to show you what she sent me until I had it all printed out, but good 'ol Shipley gave me a brilliant idea and I am going to have it printed and bound this week!! I can't wait!! I think she read my mind because I have been trying to find time to create a digital planner and I really needed to get it finished. 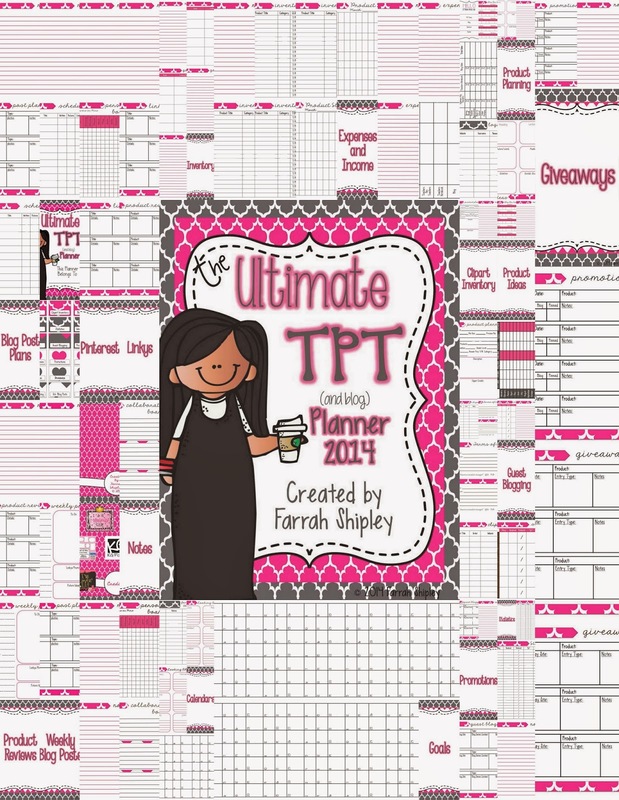 Her NEW Ultimate TpT Planner!! So Stinkin Cute & useful!!! When she said she wanted to send me something, I never thought it would be the exact thing I really needed right now!! I totally perked up and wished I could have hugged her through my computer! I am so excited!! I was going to print it here, but I decided that I will have it printed and bound professionally - I can't wait!!! I think my next big investment will be a binding machine!! I could really use one! She had no idea I had just read a message that had me in a bod mood and totally uplifted my spirits!!! Well, now she'll know..haha!! So the planner is packed full of goodies and perfect for what I needed. God is so good to me!! He would not allow me to go to bed without a divine intervention of giggles from a friend and a planner to help me stay organized!!! The planner is only $10.00 AND is marked down right now for $8.00. I have no idea how long the discount will last, but you better go grab one of these if you want to get this new year started right, my friends!! hahaha... I seriously wanted to cry!!! I will show you all what it looks like printed and bound in about a week. Click on the image below to grab your own Farrah Planner (tehehe)... there are several styles to choose from - just in case pink is not your thing. I also noticed that she also created a MAN version!!!! Clever!!! My lesson to all of you is not to let the small things overwhelm your mind.. it will consume your creativity and ability to think positive thoughts. Let the snarkey people be negative and keep a happy tune in your heart.... I am so thankful for great friends who remind me what is truly important!! Girl you are just FABULOUS! As my teenage daughter would say! You never know when those little guardian angels are out there and you were one for me last night! You don't know this but I was having one of those "moments" like above as well but with regard to my school and YOU CHEERED ME UP! How awesome is that! So here is to my friend...thank you so much for the shout out and I hope you LOVE IT! YOU ROCK and your designs and work are PRICELESS!!! AWE!!! That makes me so happy!! We were meant to find each other last night and make each other giggle!!! You are so amazing!!! I'm so glad I clicked over to your blog today. Great planner! Thanks for sharing. Glad you were able to find some humor last night, so you didn't have to go to bed angry. Have a great weekend. Farrah did a great job on the planner and she is working on more styles as I type... Love that woman!! I believe I've dealt with the same person...or one just like her. It's the type who thinks because she's paying for something she can be a bee-otch! I hope she isn't that way with her students too. Don't I know it, Erika!! I am glad I passed that one by..haha.. I have only ever had to part ways with one person and she literally had me in tears. I don't think many people realize that when they tell a designer exactly what they want, despite the professional expertise of the designer, and the designer creates it... then the client does not like it.... how incredibly frustrating that process can be. Or when someone wants two conflicting designs.. or when you are already in full swing on a project and the client starts sending you screenshots of other people's blogs that they like and want you to try to incorporate into a theme that will not work. Luckily for me, those personality types have been the minority of my client base. I am very blessed that I have had more wonderful experiences than terrible ones.